After a prolonged hiatus Read, Watch, Play! is back for another episode. Stu, Chris and myself caught up at Oz comic-con Sydney and manged to record a podcast a quick podcast. We talk all things Oz comic-con, Chris talks about his dinner with Karl Urban, Stu talks about the creatively titled Louie Theroux documentary 'My Scientology movie' and I just generally laugh and nod. As always the podcast is jam packed full of rants and ramblings on pop-culture topped with a healthy portion of piss-taking. All in all it's everything you have come to expect from a Geek of Oz podcast! 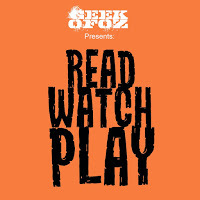 As you have no doubt figured out by now any sense of scheduling has been thrown out the window and at this point we will just try and get an episode of Read, Watch, Play! out when ever we can. On the bright-side Stu and Billy have been absolutely killing it with there film and television focused podcast We like to Watch. Episodes drop every week or so and you can check out the latest installment here. Finally, just wanted to say a massive thanks to the wonderful team at Oz Comic-con for looking after us and once again going all out to create one of Sydney's best pop-culture conventions. As you will no doubt be able to tell from the podcast we had a blast. Well that's all from me for now. Until next time, enjoy!